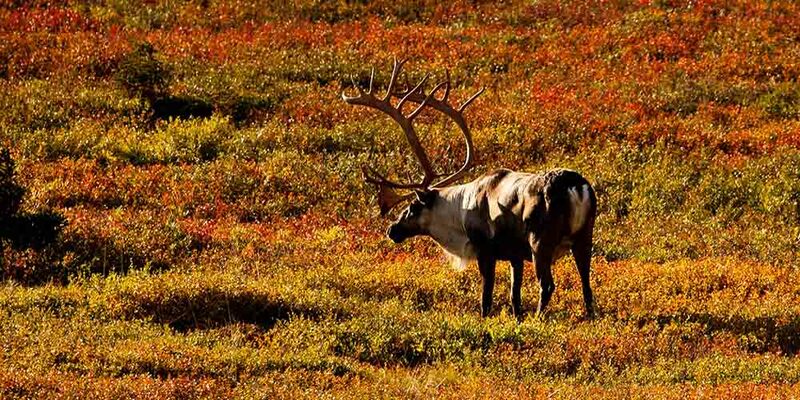 Caribou Park was formerly part of a farm owned by a pioneer named Thomas Snider who resided here from the 1830’s to the 1870’s. 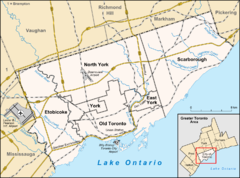 The Snider farm took in the entire present day neighbourhood and also included land west of Bathurst Street. 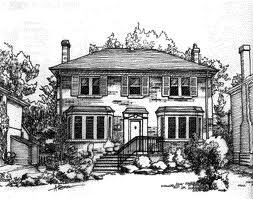 Remarkably, the Snider farm house is still standing on the western edge of this neighbourhood at 519 Glengrove Avenue. The Snider house is hidden from the street by two towering blue spruce trees that stand guard over this historic house. Caribou Park has two very distinct residential pockets. The Georgian, Tudor, and English Cottage style houses closer to Avenue Road and east of Caribou Park were built in the 1930’s and 1940’s. The houses along Otter Crescent that back onto the ravine and the Otter Creek are generally situated on premium lots that command the highest prices in the neighbourhood. The split-level houses and ranch style bungalows located west of Caribou Park and closer to Bathurst Street were built in the 1950’s and 1960’s. Some of these houses have been replaced by modern custom built homes. Many of the homeowners in this area are members of Toronto’s Jewish orthodox community that is centred along Bathurst Street. Caribou Park residents enjoy the luxury of being able to walk to the popular shops and restaurants on Avenue Road, north of Lawrence Avenue. This shopping district is anchored by the Pusateri’s Food shop which attracts shoppers from all over the city. The mix of stores along Avenue Road includes children’s shops, home decorating and furniture stores, clothing stores, antique shops, two large video rental stores, and family style restaurants. Caribou Park residents can also walk to the Bathurst and Lawrence shopping district which is anchored by the Lawrence Plaza at the north-west corner of Bathurst and Lawrence. This shopping plaza attracts shoppers from far and wide to its outstanding collection of discount and outlet stores. Bathurst Street itself contains many fine Jewish food shops and bakeries featuring some of the finest bagels in town. 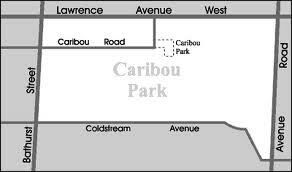 The Caribou neighbourhood park is conveniently located right in the centre of this neighbourhood off Caribou Drive. This park features a popular children’s playground. The ultra-modern Barbara Frum Public Library at 20 Covington Road includes a children’s storyroom, French and multicultural collections, and an auditorium with a 150 person seating capacity. This library is combined with a 10,000 square foot recreation centre that contains multi-purpose rooms, a kitchen/craft room and meeting rooms. 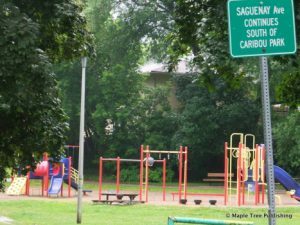 A small park near Lawrence Avenue West and Avenue Road that features a children’s playground. 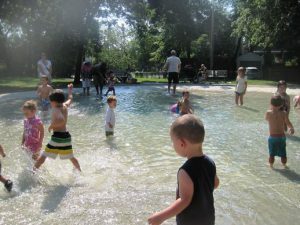 This park includes a great splash area green space to run around and the beautiful trees. There is also a playground with swings and a sandbox, and bathrooms are on site. Woburn Park’s off-leash dog area is located in the northwest section of the park. This area is fenced off. Woburn Park is located just east of Bathurst off of Cranbrooke Drive. This is a very small neighbourhood park. It is fully fenced in with a single entry point. A 1.5 hectare park on Avenue Road north of Lawrence Avenue West. 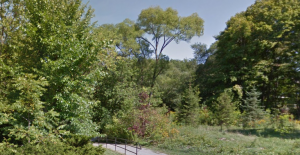 This park winds north west through the neighbourhood from Avenue Road and Woburn Avenue to Grey Road and Fairlawn Avenue. A mature tree canopy covers the trail through the park, and a children’s playground can be found at near the south end of the park. A small tree line park near Bathurst Street an Lawrence Avenue West featuring a children`s playgorund and an open green space. A 1.7-heactare park on Avenue Road south of Glencairn Avenue that features three lighted outdoor tennis courts with a club house, 2 lighted lawn bowling greens with a clubhouse and a children’s playground. 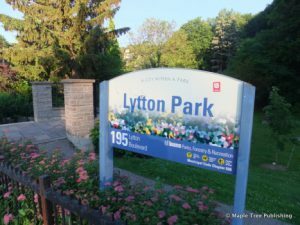 The park is home to the North Toronto Tennis Club and the North Toronto Lawn Bowling & Croquet Club.